This post uses affiliate links. Clicking and purchasing from any of these links helps to support this blog. Let me start this post off by stating I am not a medical professional, but I know a lot about acne. I had it as a teen and now as the mom of teens I am brutally remembering how big of a bummer it can be. Over the years in my many attempts to learn how to treat and combat acne I have learned quite a bit. I first started off by hitting the aisles of my local drugstore, and buying every product that said it would treat acne. In my continued quest I then moved onto higher end stores, products, salons, and even specialized Dermatologists. The aggravating thing about acne is that a product or skin care routine which might have had great results for someone else can potentially do absolutely nothing for another person who tries that same thing. Keep this in mind as you search for answers to treating your own skin problems. There really is no one quick solution. Instead think of it as a process that might require some trial and error on your part. As a special note, I have also tried some of the professional medical options out there for treating my own acne and that of my teens. Unfortunately, not all people are a good fit for that type of treatment. If you are in this same boat don’t get discouraged. There are many items in your own pantry you can use right now to help combat acne. So in no particular order, here are some of the things I have found that work. We are going to talk about some basics and then some specific treatments you can do right at home. 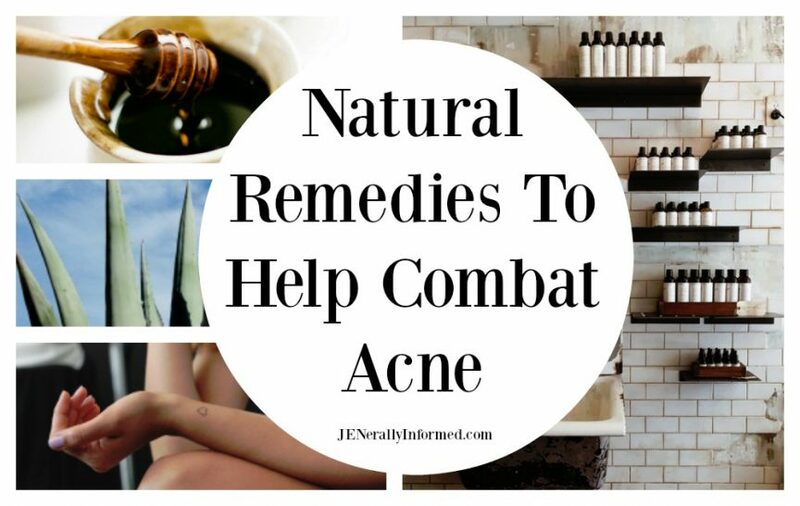 Natural Remedies To Help Combat #Acne. When I was a teenager I remember hearing that chocolate caused zits. Although that isn’t specifically true I have noted a definite decrease in both my own acne related problems and that of my teens when we watch what we eat. There are a lot of supplemental products out there that say they will treat acne causing bacteria in your gut. I have tried a lot of them, but what I have found to be most beneficial is to eat minimally processed food, and make sure you include plenty of plant fiber (fruits and vegetables) into your diet. In our family we also cut out dairy for one of my kiddos, and not only did we see a huge difference in her skin, but many of her previous stomach complaints went away. It might be a good idea to track what you eat for a little bit and see if any of it is a trigger for you. This doesn’t mean you stop eating everything and anything, just take a look and see if you can track down the things that might be making your digestive system a less than happy place. Which then causes flare ups on your skin. We mainly work on keeping our gut healthy through what we eat and drink as a family, but here are some of the products I use and love to help me do this. As a disclaimer I am a Young Living enthusiast and distributor, but remember there is no one quick fix to do this and some of these products might not be the solution for you. Both of these work on digestive health and focus on helping to increase the amount of greens you ingest. Or perhaps you might want to look into an over the counter probiotic that will help you maintain a healthy gut. There are some really goods one out there that won’t break the bank. About a year ago I read an article that detailed research findings for patients who where prone to acne had also been found to have low levels of zinc. After reading the studies I thought it was worth a try for one of my kiddos. The articles recommended 30 mg a day. I went out to my local grocery store and picked up a bottle of 250 tablets of 50 mg. I cut the tablets in half and have my kiddo take half a tablet a day. Or you can grab the zinc here as well. Six months out I feel like we are seeing the results we would like to see for that kiddo. Whether it is the zinc or the overall changes we have made I guess I can’t be quite sure. What’s The Deal With Hyaluronic Acid? Hyaluronic Acid is the buzz word in beauty these days. Everything has Hyaluronic Acid in it. So I started researching what it is. One of my kiddos has severely dry, sensitive skin that was causing some acne problems. There is no way to really pinpoint a deficiency, but I would bet that deficiencies like this might be more common than we think. I figured giving it a try might work. I visited my neighborhood Sprouts and picked up a bottle of Hyaluronic Acid supplements. It was kind of expensive in store, about 30 dollars, so now I buy it off Amazon . My kiddo and I take a tablet in the morning and one at night. Whether or not it is a cure-all, I don’t think so. Overall though I think we are seeing the results we like, so I will keep researching more data, but I like what I am seeing. We have noticed a difference in the feel, hydration and plumpness of our skin. This sounds so simple it’s dumb. Except it isn’t. Drinking water helps to keep your system hydrated and flushes out bad toxins from your gut and the rest of your body. Some people think scrubbing away acne or using overly drying products will treat acne. It doesn’t. This is where an understanding of pH comes in handy. pH stands for the “power of hydrogen” or “potential of hydrogen.” When your skin’s pH levels get out of whack this can cause sebum and acne to increase, because your skin’s natural barrier has been broken down. Just like the bacteria and yeast in our gut that keep us safe, our skin flora keeps us safe from diseases like acne, rosacea, psoriasis, and dermatitis. Research has shown there is a very close relationship between the pH of skin and having healthy skin bacterium. This means you should never use products that overly dry your skin, or cause damage to your skin’s ability to maintain a healthy pH level. Make sure to use a good solid cleanser, toner (occasionally, but be careful) and a moisturizing system that doesn’t overly dry. Are you starting to see here why trying just one product and assuming it will fix your acne is kind of unrealistic? There is a lot of unseen things at play when dealing with your skin. DIY natural #acne fighting face masks that really work! Over the years I have dropped loads of money on “skin clearing” face masks, and most of them were over priced and over hyped. Here are some alternatives that require minimal ingredients and really work! P.S. I love raw honey and use it for everything! You can add it to pretty much any DIY face mask to make it even better. Green Tea has a very calming and soothing effect on your skin. It helps the skin stay hydrated as well as reduces inflammation. Honey is antibacterial, but it also provides the skin with much-needed hydration. It locks the water content in the skin and leaves it soft, smooth and supple. I use cheapo green tea bags from my local grocery store. Open the packet and combine the tea leaves and raw honey. Mix ingredients together and apply to your trouble spots or on your entire face. Let it sit 15 minutes or longer, but no longer than 2 hours. You can do this even once or twice a day as needed. I have one kiddo who calls it their spa/ calm-down therapy! Tea Tree Oil is full of antibacterial properties, and the aloe vera is great for soothing down the inflammation and redness. I use fresh aloe vera from a plant in my backyard or you can buy it pretty cheap here . Combine the two ingredients using a cotton ball. Apply the mixture to your face, or the acne affected areas. Let sit for about 10-15 minutes. Wash away with warm water, and moisturize. You can repeat the process twice in a week for better and longer results. Tone your skin, fight breakouts, and reduce acne scarring with this mask! Add 2 tablespoons of tomato juice into a large mixing bowl. Add 1 tablespoon of aloe vera. Mix well. Wash your face and neck with warm water and an oil-free cleanser to remove makeup and open pores. Apply the mask and let it dry for 15 minutes. Remove the mask by rinsing with lukewarm water. Splash your skin with cool water to close and tighten pores. Pat your face dry with a soft, clean towel. Use apple cider vinegar, green tea leaves, and honey. The apple cider vinegar and green tea leaves help to reduce sebum, and the honey kills bacteria. Add 1 tsp. raw apple cider vinegar, 2 tsp. green tea leaves, and 1 tsp. honey to a bowl and mix well. Use your fingers to gently apply the mixture on on your face. Leave for 10 minutes and rinse with warm water. Use the apple cider acne face mask 1-2 times a week to help keep a clear complexion and your skin free of pimples. Another way to use apple cider vinegar to get rid of acne is to dilute it with water and add some tea tree oil. Mix equal parts of raw unprocessed apple cider vinegar and water. Add a few drops of tea tree oil (or lavender oil). You need about 6-8 drops essential oil for every 1 oz. liquid. Shake the mixture well before each application. Apply the facial acne treatment to you face using a cotton ball. Here are some of my other favorite ingredients to add in with honey. You can pretty much use honey as a base for any DIY Face mask. Just be really careful to not scrub or use even natural products that will burn and irritate your skin! Aren’t sure how to get your hands on these essential oils? Feel free to shoot me an email at jen@practicallyperfectprincess.com and I can help! If you are suffering from acne, hang in there and don’t lose hope, and most importantly, remember you also don’t have to pay the big bucks to fight it. I hope you found this post helpful. You are welcome to leave me any questions you may have in the comments section below. I will see what I can do to come up with an answer for you. If you liked this post, you may want to check this one out too! What a comprehensive article helping with acne. I will definitely be referring back to as still many years past my own teenage years, I still suffer from a pimple here or there. So, I appreciate any and all advice on this. Thanks Jen!! I am glad you liked this! Hoping acne is not something your girl’s face, but if it is this will hep! Hi Jen, my son went through a stage of having bad skin, but nothing too bad that it bothered him. My daughter (touch wood) has been very lucky and gets the odd pimple. I think natural is the way to go when possible, my first answer to most ailments is to drink more water, so that did make me laugh… Homemade face masks are the messiest, especially in summer, but that’s a good excuse to keep licking! I never had acne as a teen but my sister did and went to the dermatologist. For me, it hit in my mid-20’s and it was fierce! I think I tried everything expensive and it didn’t do a thing. It’s like you said – and sometimes from the inside out. Maybe it was time that worked for me, or drinking a lot of lemon water. I would do vinegar and crushed aspirin masks and also rub lemons on my skin! See everyone has what works for them, that’s because acne is so very individualized. We have tried aspirin before for large cysts and it did indeed work! Wow! Thank you for sharing so much good information. I didn’t know most of this! One of my sons is struggling with acne. It’s tough to know what triggers it. Great idea to keep a food record. I hope doing that helps! It’s a pretty easy thing to do, but it really is a great clue to finding out triggers. So many great tips here! I have two kids heading into the teen years with a touch of acne each and since I myself have had acne ever since the teen years I feel a bit powerless to help them. Lots of things on here for us all to try. Pinned. Thanks for sharing! It’s true that not everything works the same for each person. It can be a lot of trial and error. That first Aloe Vera Face Mask looks super nice though! !